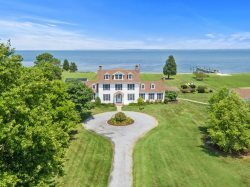 Strategically positioned on a point of land at the convergence of the the Tred Avon and Choptank Rivers, Broadwater View offers the best of what Talbot County has to offer from sunrise to sunset. Coastal contemporary on the outside, warm and homey on the inside, this is truly a one-of-a-kind property! From swimming laps in the pool to playing a game of billiards and taking in all those spectacular water views, guests find it hard to leave Broadwater View. While the main house has ample room for you and all your guests, there is additional living space in the pool house. Experience all that Talbot County has to offer by booking Broadwater View today! The dock is great, but the floating section is not well positioned to make it easy to launch kayaks or paddle boards. It could be adjusted to be closer to the fixed dock and, perhaps, have a small ladder to make getting up and down easier. Everything went very smoothly. Great property.